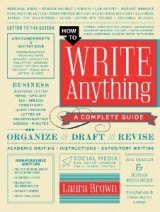 Laura Brown's "How to Write Anything: A Complete Guide' (W.W. Norton, 608 pages, index, $35.00) is the most comprehensive guide to writing I've seen. I wish the book had been available when I was in college more than 50 years ago. As it happened, I was blessed with wonderful English teachers in both high school and college -- teachers who inspired me to major in English, which led me to take up journalism as a profession. Brown shows the reader how to write everything: from letters of complaint, thank you notes, invitations of all kinds, speeches, cover letters for resumes, letters of recommendations, college essays, even book reviews. I liked the way she included examples of poor writing -- "Don't do this" -- along with much better examples: "Do this." She also includes writing by contributors, including college students. Yes, the book would be an ideal gift to any student. I've written about the need for classic style books, like Strunk and White's "The Elements of Style" (http://en.wikipedia.org/wiki/The_Elements_of_Style), but that classic, published in 1959, needs to be supplemented by a book for the age of the Internet. Brown's book is the best I've seen for today's writer. "How to Write Anything" has more than two hundred how-to entries and easy-to-use models organized into three comprehensive sections on work, school, and personal life. It's a book that's written in a style that's friendly and supportive. I've given a few speeches in my time and I agree with her statement that this activity is one of life's scariest experiences! In the speechwriting section (pages 408-412), she gives great advice on how to write the speech that's tailored to your audience, how to practice it before you get up on that platform (am I scaring you enough?) and how to have a friend critique it. In fact, having somebody you respect critique your writing is a great idea. Let's say you're applying for college. Brown shows how to write application essays that will stand out. Somebody is hogging the parking in your neighborhood, blocking your driveway. Brown shows how to write a note for the offender's windshield that won't end up with your tires slashed. A neighbor persists in putting out his garbage containers days before the scheduled pickup. Brown shows how to write the proper note. PowerPoint presentations are one of the most common tools in business, and Brown has spot-on suggestions on how to write effective PowerPoint slide copy. On point she mentions deserves singling out: Just because your Mac or PC has dozens of type fonts, don't make the mistake of using too many in a slide. "How to Write Anything" is at once a how-to guide and a reference book. No matter how long you've been writing, you can always improve you work and Laura Brown has just the book for you.